OpenBazaar a decentralized, free P2P market! Bitcoin is slowly revolutionising the word “money”, concept like cryptocurrency, decentralized network and microtransactions have suddenly become more common. In the meanwhile OpenBazaar was born. Open Source: the source code for the software is freely available and anyone can see it or contribute to it. No-fees: no additional fees are associated with transaction, you won’t pay/get anything more/less than what you buy/sell. No-restrictions: everything can potentially be listed on OpenBazaar. 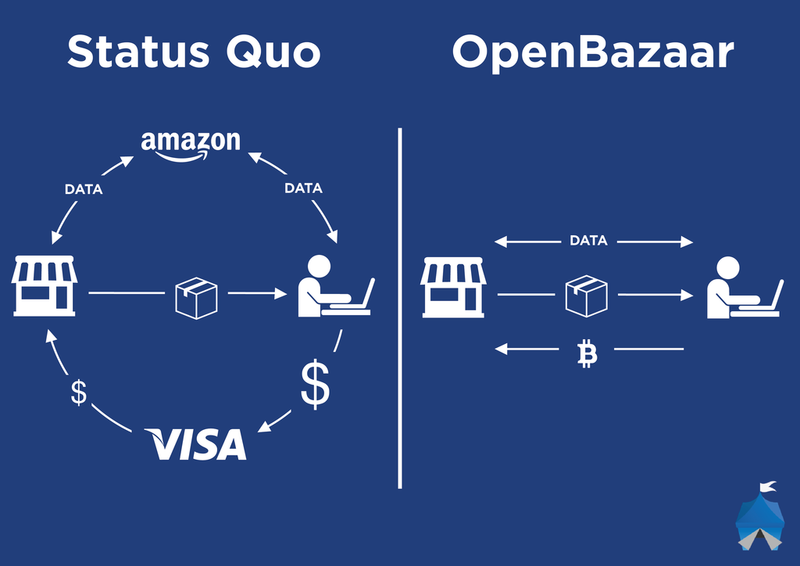 Decentralized: there is no central authority like a bank or a government, also there is no central server: everything is independent and there is no way to control OpenBazaar from a single point. Peer-to-peer: all the transaction are performed without a central third-praty so that buyer and seller can interact without interference. E-commerce: an electronic form of commerce that uses computers and technology to assist the process. Now everything is a little bit clear, but how is all of this achieved, and how does it work? OpenBazaar: how does it work? OpenBazaar transaction opposed to current process. OpenBazaar borrows the strength of Bitcoin to process payments, as a matter of fact it is the only currency available as of the time of writing this article (more cryptocurrencies are on the roadmap). So in order to use OpenBazaar you will have to set up a Bitcoin Wallet (but this is not mandatory until your first purchase/sale). Upon registration, you will be assigned a unique ID that represents your identity. Using this id you can invite others to browse your store (if you have one). And if you don’t plan on selling anything, you will need the id of the store you want to buy from. Aside from IDs sellers may want to register @handles: common names identified by a @ and associated with a unique ID. To access a store you need a unique ID but if you don’t, there’s a useful feature called Discover that shows you items from your network or completely random. The listings can also be tagged using #hashtags which enables seller to list their products better. Direct payment: the Bitcoins are transferred directly from buyer to seller. Moderated payment: a third-party Moderator (a user) joins the transaction. The direct payment is quite risky since if something goes wrong, everything is up to the seller since Bitcoin transactions can’t be refunded without explicit consent of the new owner of the money. On the other side the moderated payment creates an escrow between buyer and payer and introduces a moderator. Most of transaction will go smoothly and the moderator won’t even be called, but in the case something goes wrong the moderator is needed to move the funds out of the escrow. The moderator itself will not hold the money, he will only determine who is at fault and release the funds. That means that choosing a trustworthy moderator is essential. Offline store: To keep a store up, the OpenBazaar server needs to be on: every time it isn’t reachable the potential buyers won’t be able to connect. This is easily solvable by buying a VPS from a provider and installing the server on it. Inventory Management: There is currently poor inventory management and no way to import listings from other services such as eBay or Amazon. This feature is however being currently worked on. Search: Current search regulated by #hashtags is slow and sellers can mislabel their listings. Also the hashtag doesn’t show similar hashtags. Anonimity: Users don’t have obfuscated IP addresses, so a malicious user may track what you are doing while using OpenBazaar. That doesn’t apply to transactions and chat, where end-to-end encryption is used. Reputation: The current system enables user to leave feedback only upon transaction (just like on eBay). The figure of the moderator is somewhat controversial and choosing a bad moderator can lead to a badly resolved dispute.